PETALING JAYA, Feb 21 — Koperasi Hartanah Malaysia Berhad (Kohama) executive chairman, Datuk Jali Sekak and part-time lecturer Datuk Dr Mohd Nasirudin Othman claimed trial at four Sessions Courts here today, to six counts of cheating in connection with the non-existent 1Malaysia Affordable Housing Project involving a loss of RM5.36 million, three years ago. Jali, 52, and Mohd Nasirudin, 41, pleaded not guilty to the charges which were read out before judges Norshila Kamaruddin, Hilmiah Yusof, Azwarnida Affandi and Mabel S. Muttiah. Jali’s wives, namely Norhaizan Yahya, 45, and Nur Nadia Yusof, 30, were also charged with abetment and misappropriation involving RM2.56 million in total over fraudulent construction of non-existent affordable homes. Based on the charges, Jali, who was also former Koperasi Pembangunan Hartanah Putrajaya Berhad (KPHPB) chairman and Mohd Nasirudin, had allegedly cheating six individuals (contractors) by deceiving the victims to believe in the existence of the housing projects offered to six companies by KPHPB. The construction of the affordable homes were alleged to have taken place in Labis, Segamat in Johor; Sungai Soi, Kuantan and Mentakab in Pahang; as well as three locations in Perak including Setiawan and Bidor. 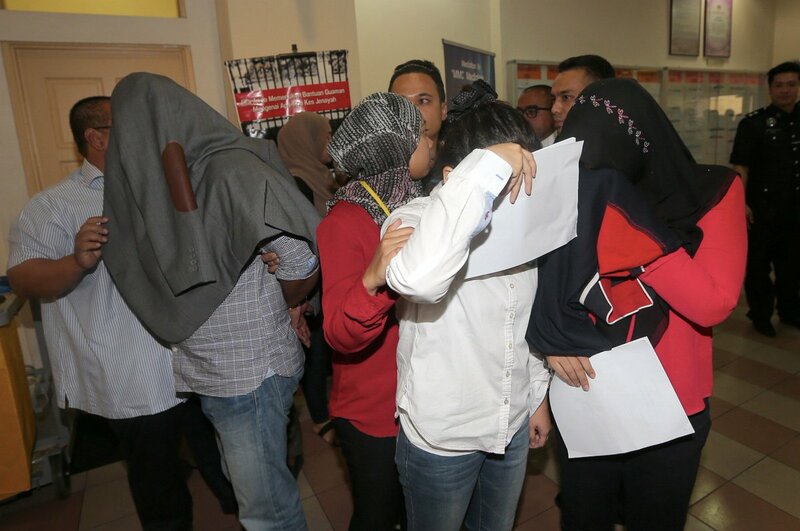 Subsequently, all the victims were alleged to have handed over the RM5.36 million in total as a bond to become the contractors for the housing projects. Jali and Mohd Nasirudin had allegedly committed the offences at Koperasi Putrajaya Berhad in Putra Heights, Subang Jaya between Sept 2013 and Feb 2014. They were charged under Section 420 of the Penal Code, read together with Section 34 of the Code which provides for a maximum jail term of 10 years and whipping and a fine. On the other hand, Nur Nadia was charged with abetting with three others, including Jali and Mohd Nasirudin to deceive P. R. Parry, 57, of RM1.2 million into believing that the construction of the 1Malaysia Affordable Housing Project in Kampung Sri Rahmat, Segamat, Johor as offered to Friendly Field Sdn Bhd by KPHPB, existed. The charge under Section 420 of the Code, read together with Section 109 of the same law provides for a maximum jail term of 10 years and whipping and a fine. PETALING JAYA: The Koperasi Hartanah Malaysia Bhd (KOHAMA) chief executive, wife and a woman friend were charged in the Sessions Court here today, with 35 counts of money laundering amounting to RM2.1 million. Datuk Jali Sekak, 50, wife, Norhaizan Yahya, 44, and Nur Nadia Yusof, 28, pleaded not guilty to all charges which were read out before Sessions judge Munira Mohd Nor. Jali, who was at that time Koperasi Pembangunan Hartanah Putrajaya Berhad chief executive officer, faced three charges of receiving money from money laundering activities via a company cheque belonging to Nur Nadia, namely Pro Speed Resources in Hong Leong Bank Berhad, Subang Jaya here between Nov 2013 to Aug 2014. Otai BERSIH added 4 new photos. melesapkan rm 85 juta duit kontraktor Rumah Prima mampu milik….Sesiapa yg tahu dimana orang ini berada repot segera…. Mereka adalah kroni2 Datuk Ahmad Maslan …tubuhkan Koperasi Hartanah Putrajaya Berhad semasa Datuk Ahmad Maslan menjadi timbalan menteri kewangan. Tahniah kepada PDRM yg mengambil tindakan keatas penjenayah2 ini,walaupun terlalu lama mengambil masa. Assalamualaikum & Selamat Sejahtera Tuan/Puan. i) Borang Seksyen 28(a) KPJ (Hak-Hak Orang Ditahan) Diserahkan Satu Salinan Dan Ditandatangani Oleh Oyds. This entry was posted in Uncategorized and tagged crime in malaysia, datuk jali sekak, malaysia, money laundering, VVIP Big Shot and crime. Bookmark the permalink. 1 Response to Kohama executive chairman, Datuk Jali Sekak, and his 2 wives: Charged with money laundering!